Hello, and happy New Year! To start 2014 off right, I’ll be profiling Avangardco Investments Public Ltd, the top producer of eggs and egg products in Ukraine and the surrounding region. 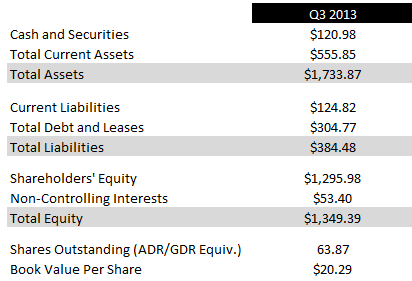 Despite great operational success and strong growth, Avangardco trades at an absurdly low multiple of earnings and assets. Avangardco is set to begin paying dividends in 2014, which may cause the market to re-evaluate the company’s prospects. Despite its strong fundamentals, Avangardco also carries substantial risks. The company’s primary place of business is Ukraine, not one of the world’s more stable economies. 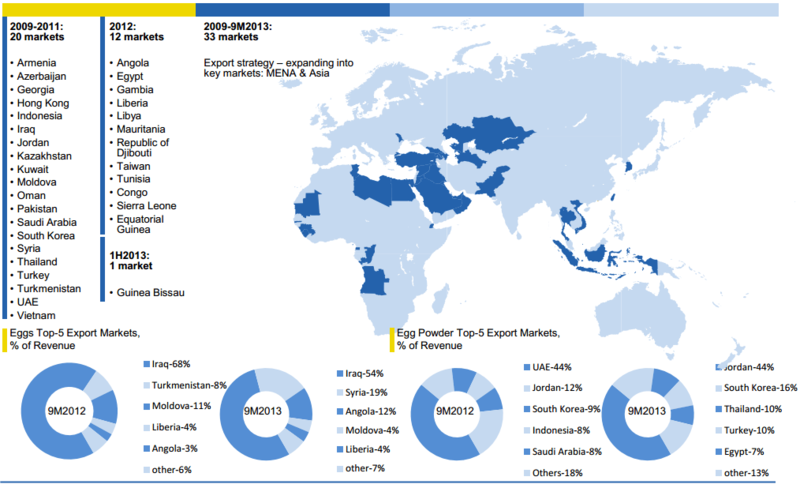 Avangardo’s leading export markets are various Middle Eastern nations, including Iraq and Syria. Finally, the company is nearly 80%-owned by a Ukrainian billionaire, Oleg Bakhmatyuk. No worrisome related-party transactions are disclosed by the company, but Mr. Bakhmatyuk seems to be a “colorful” character based on some googling. Given the reputation of Eastern European and Russian billionaires, the risk of corruption and management pocket-lining is elevated. Avangardco’s business operations are located in Ukraine. Ukraine has historically been one of the world’s most agriculturally productive nations, earning the nation the nickname “The breadbasket of Europe.” While the USSR was in existence, Ukraine was responsible for 25% of total Soviet agricultural output. 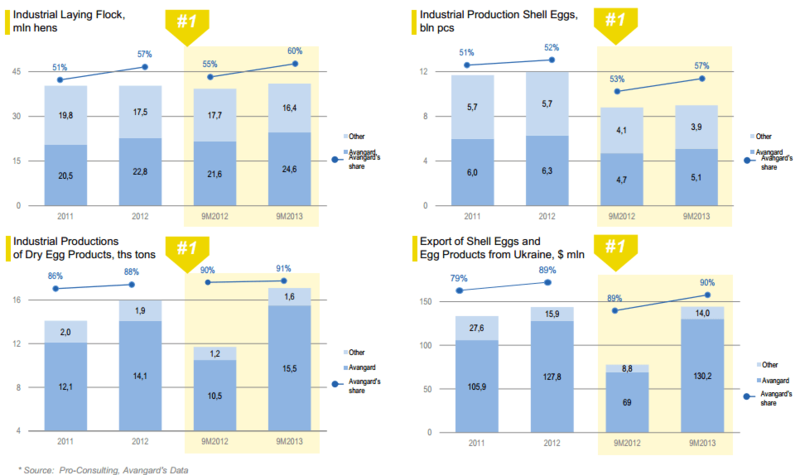 Today, Ukraine remains a major food exporter to Russia, the European Union and the Middle East. Ukraine’s tax policies strongly encourage the expansion of the agricultural industry. Companies that earn 75% or more of their revenues through agriculture are no subject to corporate income tax, but instead pay a de minimus Fixed Agricultural Tax based on farm acreage owned or rented. Agricultural business are also not required to remit Value-Added Tax revenue to the government, but can instead retain it for use in developing additional capacity. This special VAT treatment is scheduled to continue until 2018. For more information on Avangardco’s tax treatment, check out this PDF from Deloitte. While Ukraine’s fertile lands and highly advantageous tax regime make it an attractive place to do business, the unstable political atmosphere should lead investors to approach with caution. Ukraine is locked in an ideological struggle between those who would look Westward and make progress toward greater unity with the West and eventual EU membership, and those who would have closer ties with Ukraine’s ancient sometimes-ally, sometimes-enemy, Russia. Until the struggle is resolved, investors will rightfully apply a political risk discount to Ukrainian assets. If the struggle ends in a move toward Russia and Russian-style oligarchy and klepto-capitalism, this discount may become permanent. Avangardco went public in 2010, offering 1.39 million new shares for proceeds of $208 million. These proceeds were used to fund capacity expansion. The company had previously been re-structured in 2009, when crushingly bad economic conditions and a high debt load necessitated a debt for equity swap. Avangardo’s GDRs stake on the London Stock Exchange with the ticker AVGR. 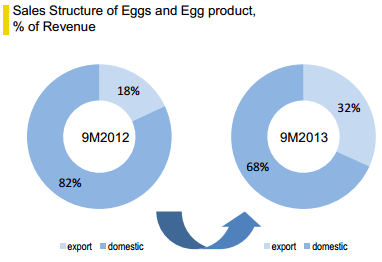 In 2012, Avangardco’s flock included 27.5 million hens which produced 6.3 billion eggs. The company included several interesting charts in recent reports which sum things up better than I ever could, so I am reproducing them below. 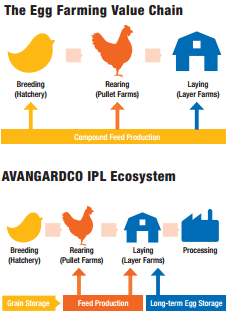 Avangardco’s vertically-integrated structure reduces costs and makes the company the low-cost producer in its markets. Avangardco is Ukraine’s market share leader in all of its markets, both domestic and export. The company has a near monopoly in dry egg products, and is responsible for 90% of Ukraine’s egg and egg products exports. Avangardco’s export operations have really picked up steam, climbing from 18% of sales in the first nine months of 2012 to 32% in the first nine months of 2013. Since 2009, Avangardco has expanded its export operations to 33 international markets. Despite its strong profits, free cash flow has been consistently negative since the IPO. While ordinarily this negative free cash flow would be a concern, Avangardco has had a strong set of growth opportunities which have required significant capital expenditure. That capital expenditure has proven fruitful, with revenue growth of 47.8% and net income growth of 24.2% since 2010. The full benefit of Avangardco’s capital program has yet to been fully reflected in results, as the company is working to complete three projects: the Avis egg production complex, the Chornobaivske egg production complex, and the Imperovo Foods egg processing plant. Once these projects have been completed, Avangardco will be able to house 30.1 million egg-laying hens and will increase its egg production capacity by 36.5% to 8.6 billion per year. Despite the large capital expenditure program, Avangardco’s balance sheet remains healthy and net debt is only 0.63x EBITDA. Liquidity is very good with a current ratio of 4.45, and equity represents 77.8% of total capital. Avangardco’s valuation is among the lowest I have encountered. The company’s P/E ratio on trailing earnings is 3.20, and its EV/EBITDA ratio is 3.16. As cheap as Avangardco appears to be on an earnings basis, the company is just as cheap on an asset basis. Avangardco’s book value per share is $20.29, and virtually all of that is tangible. At the closing trade of $11.50, Avangardco trades at a discount to book value of 43%. 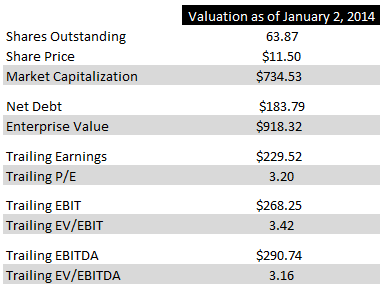 Even with its potential risks, a little over 3x earnings/EBIT/EBITDA appears far too cheap for a growing enterprise with a dominant market position and little financial risk. Investors may begin to overlook some of their fears once Avangardco begins paying out dividends. In September, the company announced it had decided to adopt a dividend policy and to pay out 15-40% of earnings each year, subject to the availability of cash and striving for long-term dividend stability and growth. At the same meeting, the company elected to set 2014 dividends at 25% of 2013 net income. If next quarter’s results are in line with previous quarters, Avangardco will earn $229.52 million this year, or $3.59 per share. 25% of that figure would be $0.90 per share in dividends, good for a yield of 7.8%. Avangardco’s risks are real and include a potentially unstable Ukrainian economy, a high-risk majority owner and a dependence on nations in conflict as major export customers. However, the company also possesses a leading market position, great growth potential and firm financial footing. Combined with a rock-bottom valuation, a dividend initiation at a healthy yield and increased earnings from completed projects, Avangardco’s shares could move much higher in 2014. An account I manage holds shares of Avangardco Investments Public Ltd. I use Interactive Brokers. I have had good success buying securities on foreign exchanges. Great find. I like how simple it is to understand the thesis and the risks. How comfortable are you with the integrity of Oleg Bakhmatyuk? Is there any way he could screw minority shareholders? Being a billionaire, I would assume that Mr. Oleg would have the necessary connections, etc to achieve some level of stability in an unstable country. Can you comment on how you got comfortable owning a company in a potentially unstable country? Did you read up on Ukraine’s history? What is the worst that has happened in Ukraine’s history that might happen again? Finally – Did you buy your shares via IB? Unfortunately, I have little to go on when it comes to Mr. Bakhmatyuk’s integrity. Some googling reveals criticisms based on his investment in a North Carolina poultry operation that was a complete failure and resulted in job losses and some criticism of his company’s environmental record. And of course, politics and business tend to be inter-woven in Ukraine. It is possible that some of his wealth and status was gained through patronage and greasing the right palms. On the other hand, as you mentioned, Mr. Bakhmatyuk may have the political pull to ensure his ventures receive at least fair (and perhaps preferential) government treatment. Avangardco is audited by a major firm: KPMG. And management compensation looks reasonable for a company of Avangardco’s size. Top management took home only $2.5 million in 2012. These factors, combined with a very low level of related-party transactions give me reasonable assurance that management is not using the company as a piggy bank. Investing in Avangardco requires a risk reward assessment. A company of this level of profitability would likely trade at 15x earnings or more in the US, Canada, Australia or Western Europe. A large discount is appropriate given Ukraine’s poor stability. In a worst case scenario, a Communist or militantly pro-Russia government coming to power would likely result in a complete or nearly-complete loss for investors. Investors are left to calculate the odds of such a scenario and apply the appropriate discount. Personally, I think it is unlikely that such a hostile government would come to power in the Ukraine. Based on my analysis of current events, the population seems strongly inclined to move toward Europe, rather than retrench and repeat history by moving toward Russia. Additionally, the US and other Western powers would certainly apply pressure to keep Ukraine from falling under strong Russian influence. Realistically, I think the chances of Ukraine destabilizing to the point where the investment would be impaired are less than 25%. However, to be conservative, let’s say the chances are 40%. So there’s a 60% chance that the investment should be worth 15x earnings, and a 40% chance it is worthless. That makes the probability-weighted valuation for the company 9x earnings. That’s nearly triple the current price. That’s why I’m comfortable owning shares: the fair value discounted for political risk is much higher than the company’s current market value. However, because the risk is much higher than buying shares in more stable countries, I would never make this a large portfolio position. I used Interactive Brokers to purchase shares. For readers trying to get a good sense of the upside ahead, check-out the 2012 annual report’s Gross PP&E disclosure — over 50% of Gross PP&E is “under construction” and not operational. Is there a method you use for narrowing down a list of potential international investments such as this i.e a particular screener? I am partial to screener.co. A professional subscription is $50/month and I believe it is $30/month for individuals. I have found the data quality to be high and the service covers practically every stock exchange you could want. This is a nice find I thought it was worthy of a 1 or 2% position. But neither Fidelity international or etrade international could trade it because of the special 144 status of the security. I do not have an account with IAB. I have been buying a lot of foreign agricultural small cap stocks over the past year. There are some great values still out there. It kind of feels like buying junior oil stocks in 2004. Lots of bluesky potential ahead. Two that I have recently bought that have not yet run and are still cheap are Australian Vintage (wine) AVG:AU selling at 8 times earnings and 50% of a written down book. Pays a nice dividend also. $100 million market cap so is mostly undiscovered. Great management and they are now at the bottom of the wine cycle with the cycle just starting to turn up. This is now my top holding. If interested, compare valuation with TWE:AU or VCO .multibagger potential over the next few years. Brandes just increased their position to 5% and I certainly like having them alongside. Also buying CAM:GB or cam:ln Camellia PLC not as cheap but consider it like buying a closed end fund of small cap ag stocks at a 30-40% discount to nav. This is a great blog. Thanks for all the work you put into it. Thanks for the kind words, and for the research suggestions. I’ve done work on Camellia before. Fascinating company. I think their agricultural assets are great but they have that private bank that they practically run as a non-profit dragging them down. Still really cheap. Will be interesting how the Ukraine thing plays out. I am sure under most scenarios people keep eating eggs. 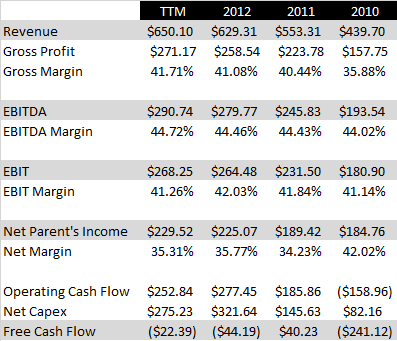 How is it that Avangardco runs such higher gross margins than cal maine? Do you know what’s going on with avancardco? The stock keeps falling down. It begins and ends with geopolitics. As long as Ukraine faces the threat of full-on invasion by Russia, I doubt the stock with rally. This has been interesting to watch. I owned for a while, but sold earlier when I was doing some global risk reduction. Stock has just been buried since then. No idea on the timing, but this just seems too stupid cheap to ignore, especially now with the divvy providing cold hard cash. While this still looks extremely cheap, I think the chances of experiencing gains while the Ukraine/Russia situation is still so volatile are low. This one will require patience. The current conflict is heading towards stabilization regarding the border between the DNR/LNR and Ukraine. Neither the Novorossiyan forces or the Ukrainian forces are fighting to any significant scale outside of Donetsk airport and intermittently shelling each other. Once the fighting stops we should see a significant recovery. Did anyone already receive their dividend? I thought they should pay it in the end of 2014. Don’t know; I got out before the currency crash and collapse in the stock price. not sure where this thing goes from here. screaming cheap on an assets basis, but there is so much noise it may be stuck down here a while. Would be interested in any updated analysis if other folks are looking to buy this one.